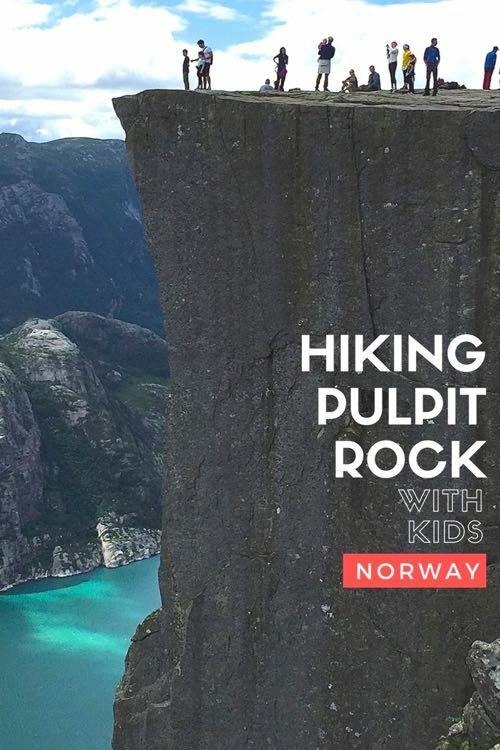 Hiking Pulpit Rock with our kids was the highlight of a two week driving trip through Norway. Also known as Preikestolen or Preacher’s Rock, this famous cliff juts out 604 metres (1982 feet) above the beautiful Lysefjorden in southern Norway. The experience and the view are simply breathtaking. Take a quick peek at our 1 minute Youtube video or just read on. Pulpit Rock is reached via a 3.8 km (2.4 mile) hike. 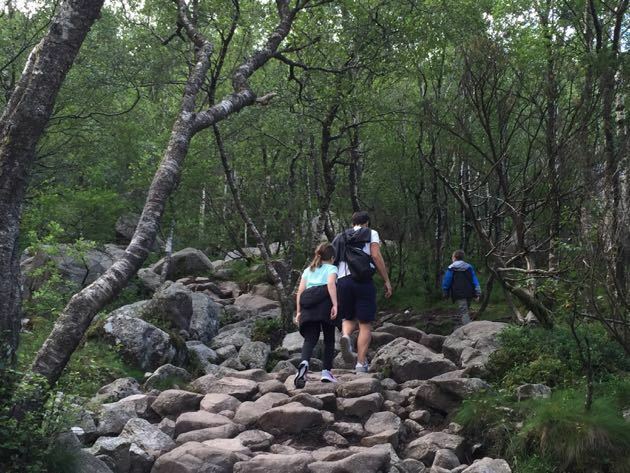 It would not be exhausting for most people (we are not hikers and do not own proper hiking gear), but a decent level of fitness certainly helps. There are staircases to climb and occasional areas where you need to scramble up some rocks (my kids loved this). It took us almost 2 hour for our ascent, mostly walking, and stopping periodically for short water or snack breaks. We were passed several times by runners who would have made it to the top in half the time, and we passed much slower groups who probably took half a day to make it to the top. We stayed at the top for about half an hour, followed by our descent of about 1.5 hours (total time on Pulpit Rock Trail was about 4 hours). 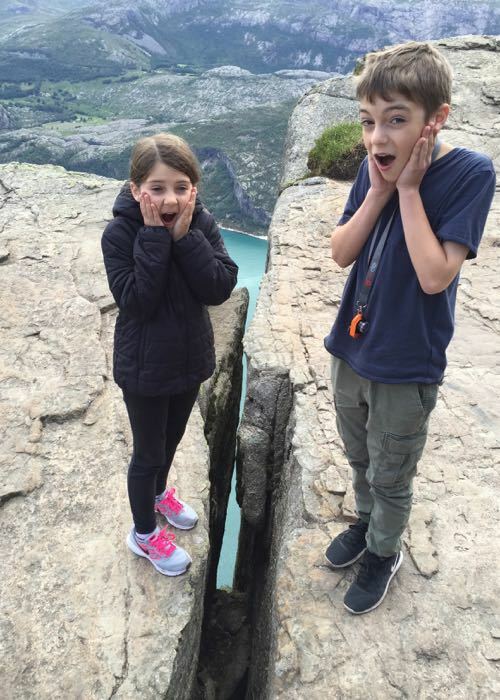 My kids (9 and 11 at the time) had no problem ascending to the top of Preikestolen. In fact, they were so excited that I often had to ask them to hold up. I would, however, recommend that children be at minimum 6 years for the climb. There are some tricky parts, and there are sections where you do need pay close attention (it is a cliff after all). We did see the odd family with a baby in a carrier and one family with a toddler who screamed until he was allowed out of the carrier, making their journey a very slow one. The exception, of course, would be those children who come from hiking families. We saw the odd one of those, where hiking Preacher’s Rock seemed to be an activity they did weekly (with the kids kitted out in pint-sized hiking boots and hiking poles). The Pulpit Rock Trail is open year round so your gear needs to be appropriate for the season. We climbed in July when the trail was mostly dry except for when we had the odd sprinkle of rain. A decent hiking shoe is best (although my new Nike trainers were fine for the weather we had), a light rain jacket (ideally waterproof as opposed to just water-resistant), sunscreen, a water bottle and snacks should be all you need. We arrived at Preikestolen by car shortly after 9am (after staying the night in nearby Stavanger), but as soon as I saw how busy the parking for Preikestolen was, I immediately wished we had arrived earlier. Although I would probably never do it, I was envious of the people we passed coming down with packs and sleeping bags on their backs. Clearly, they had spent the night at the top to have the Preacher’s Pulpit all to themselves at first light. I can only imagine how magical that would be. 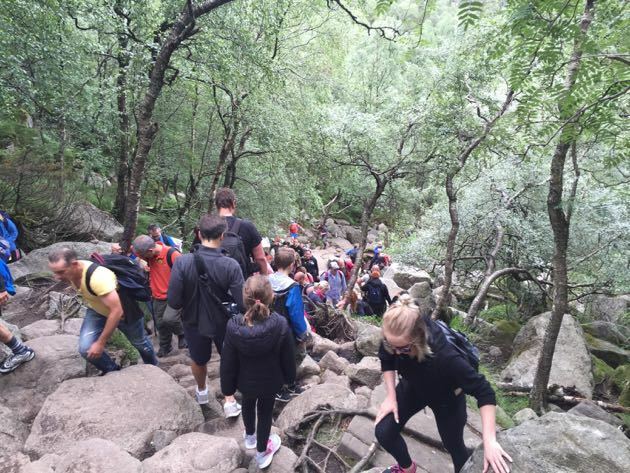 As you get closer to mid-day the trail gets very busy as shown in the photos below. Trail on the way down (around 12pm – with throngs of tourists now making the ascent). 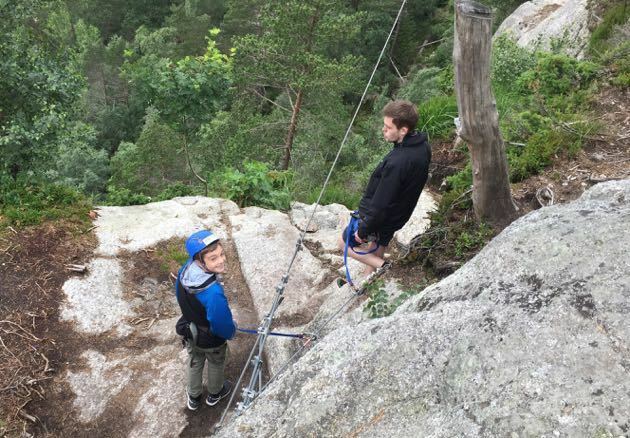 My son was delighted to discover that you could do the final part of your Preikestolen descent by zipline. A worthy ride after a hike of several hours that takes you right to the parking lot. Getting to Pulpit Rock by Car: We rented a car at the airport for our short stay so that we could get an early start the following morning and beat the tour buses to Preikestolen. There are two options for driving (taking 1.5 – 2 hours). You can Drive to Lauvvik and cross with ferry from Lauvvik to Oanes and continue along Rv 13 and follow the signs to Preikestolen. Or, your can go by ferry from Stavanger to Tau (40 minutes) and drive south on National Tourist Route Ryfylke following the signs to Preikestolen. 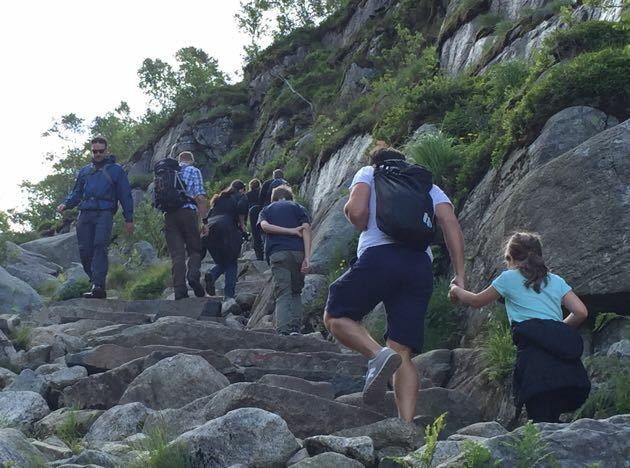 Getting to Pulpit Rock by Public Transportation: In high season (mid-April to end Sept.), you can take the ferry from Fiskepirterminalen in Stavanger to Tau and corresponding bus to Preikestolen Fjellstue where you start the hike. In low season, the bus only runs to Jørpeland, and you do this last section by taxi (9km). For more information see: Boreal Transport . www.boreal.no or Tide Buss/Norled www.tidebuss.no. For our trip to Pulpit rock we stayed in the town of Stavanger. While not as pretty as Bergen, it is charming all the same, with some nice stores and restaurants. If you are interested in buying a traditional Norwegian sweater, there is a nice Dale Concept store that has all their latest designs. We chose to stay at the Scandic Stavanger Park. We found the Scandic chain very good for families throughout our stay in Norway, because they had family-sized suites available, offered a complimentary breakfast, had healthy snacks for reasonable prices for sale in the lobby and often offered our children a welcome gift. There is also a hotel right at the base of Pulpit Rock. The Preikestolen Mountain Lodge (also known as the Preikestolen Fjellstue) is located almost at the start of the trail and would be a fantastic place to stay if you wanted to get on the trail early. During the Nowegian summer, it gets light very early, so why not? Traveling as a group? Preikestolen has some other really cool options including Mountain Camp (sleep in a hammock on a rock face) and Water Camp (sleep in a hammock next to a lake). See all options on the Preikestolen Mountain Lodge website.